Today I decided to share some ideas for quilting borders. Not every quit is going to look great with an all over design. Some of the designs I showed you before can be used as border designs, although you may have to drop some elements. A) Sprouts: This is half of the orange peel design or pumpkin seed design. When done like this it kind of looks like leaves or sprouts coming up out of the ground. B) Piano Keys: This is basically a shortened version of straight columns. Rather than stopping and starting each line you can travel in the ditch along the top and bottom of your border. C) Diamonds: How about a squatty version of Argyle. D) Jack O Lantern: This one is new and it reminds me of Jack’s teeth. It looks like an open top triangle. Again you are traveling in the ditch at the top and bottom of your border. E) Cable: Does this look familiar? It looks like our ribbon design. F) Double Diamond: Yup, it’s double argyle in a longer and narrower version. G) Clamshell: Plain and simple. 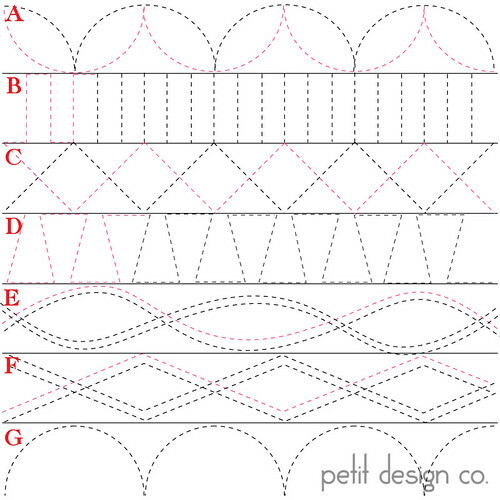 There will be more pivoting when you quilt a border simply because borders are narrow. Giving your borders a different treatment will make your quilt look extra special and is well worth the effort. Only 4 more days left in our series. I can’t believe how quickly the month has gone by! Wonderful border ideas! Thank you! I never know what to do with borders. Thanks for some inspiration! What great border ideas...thanks so much for sharing!!! because I never know what to do with the borders, I just continue mt center quilting lines into the borders. Would be nice to try one of your ideas next time I make a quilt with a border.